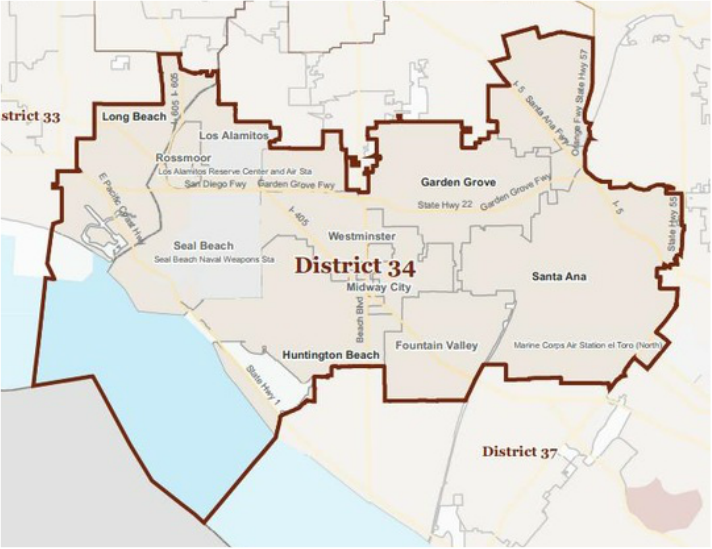 Republican Janet Nguyen currently represents Senate District 34 and will not be termed out until 2026. Nguyen will not be up for re-election until 2018. When Janet Nguyen was elected to the California State Senate in 2014, she became the state’s first Vietnamese American to serve in the legislature’s upper house. Senator Nguyen is the highest ranking Vietnamese-American elected official in California and the highest ranking Vietnamese-American woman elected official in the United States. A small businesswoman, Janet has a history of public service to the Orange County community. In February 2007, Janet was elected to the Orange County Board of Supervisors and overwhelmingly re-elected in 2008 and 2012. She was the first woman Supervisor to represent Orange County’s First Supervisorial District, the first Asian-American and the first Vietnamese-American, to serve on the Board of Supervisors, as well as the youngest Supervisor elected in Orange County history. Janet Nguyen previously served on the Garden Grove City Council where she was the first woman Councilmember elected in nearly 35 years and the youngest member ever elected. She is former Vice-President of Government and Public Affairs for the Long Beach Area Chamber of Commerce. Janet was awarded the We Give Thanks 2004 Women of Vision Award, which recognizes outstanding women who have provided exceptional services to the community. Nguyen was also named to the Class of 2008 Latino OC 100 for her work with the Latino community, and was awarded the 2008 St. Anselm’s Cultural Diversity Award. In addition, the Orange County Register has listed her as one of the “30 Vietnamese-Americans to Watch” and she was named one of OC Metro Magazine 2006 “25 Hottest People” in Orange County for her demonstrated leadership and influence in Southern California. Born in Saigon, Vietnam, Janet Nguyen and her family escaped their homeland on a small wooden 10-meter boat sailing across the South China Sea in search of freedom. After passing through numerous refugee camps, Janet and her family arrived in California in 1981. She is a graduate of the University of California, Irvine. She resides in Garden Grove with her husband, Tom and two sons.